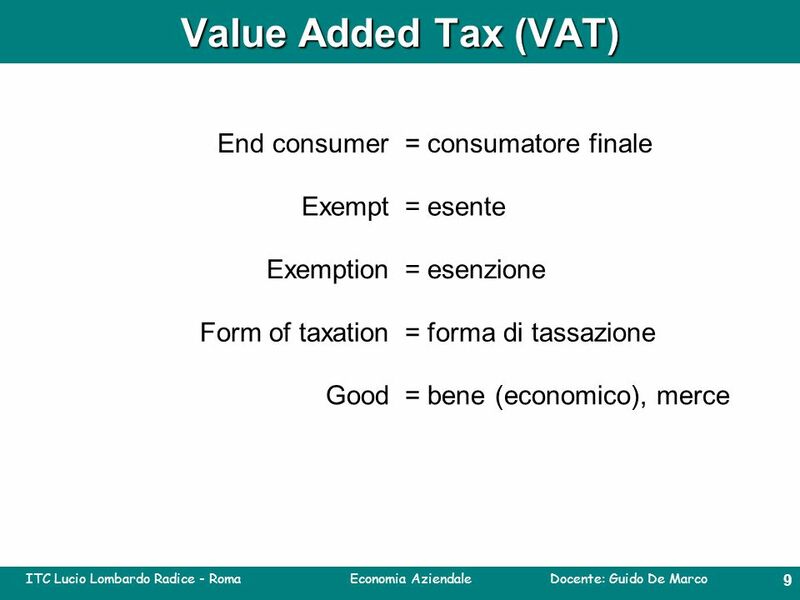 ITC Lucio Lombardo Radice - Roma Economia Aziendale Docente: Guido De Marco 0 Economia Aziendale ITC - Lucio Lombardo Radice Roma 3 F sistemi informativi. 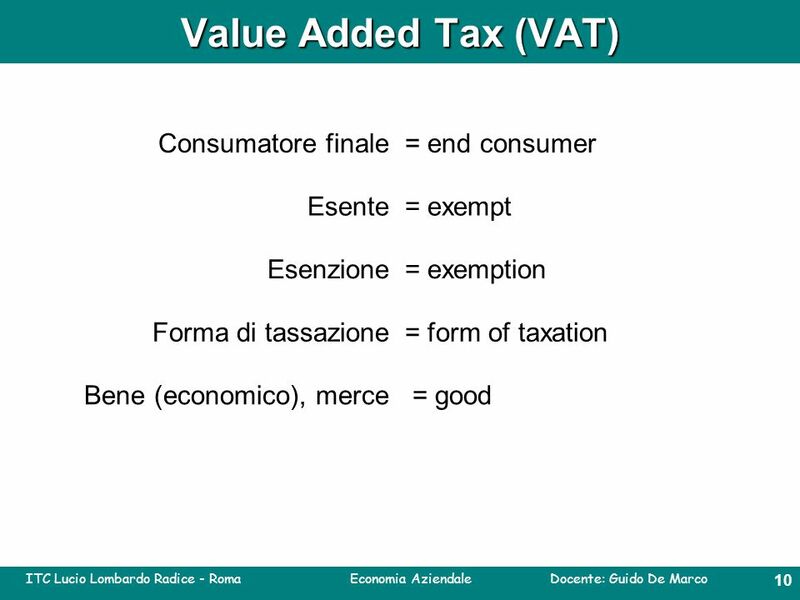 2 ITC Lucio Lombardo Radice - Roma Economia Aziendale Docente: Guido De Marco 1 Value Added Tax (VAT) A sales tax is a tax, usually paid by the consumer at the point of purchase, for some goods and service, separately from the base price; the tax amount is usually calculated by applying a percentage rate to the taxable price of sale. 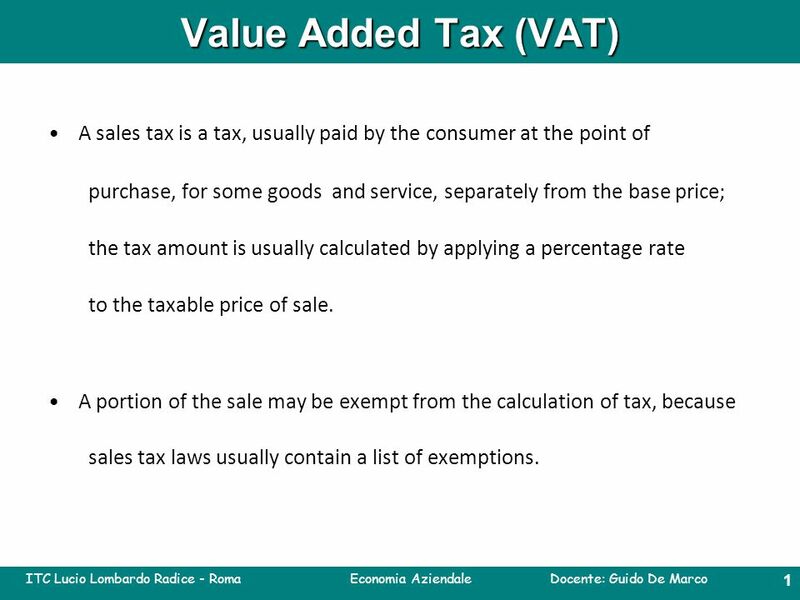 A portion of the sale may be exempt from the calculation of tax, because sales tax laws usually contain a list of exemptions. 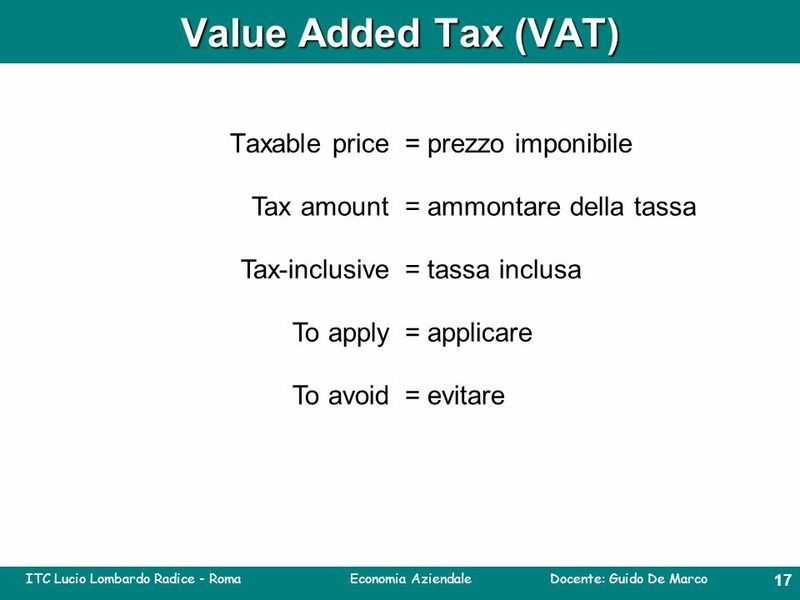 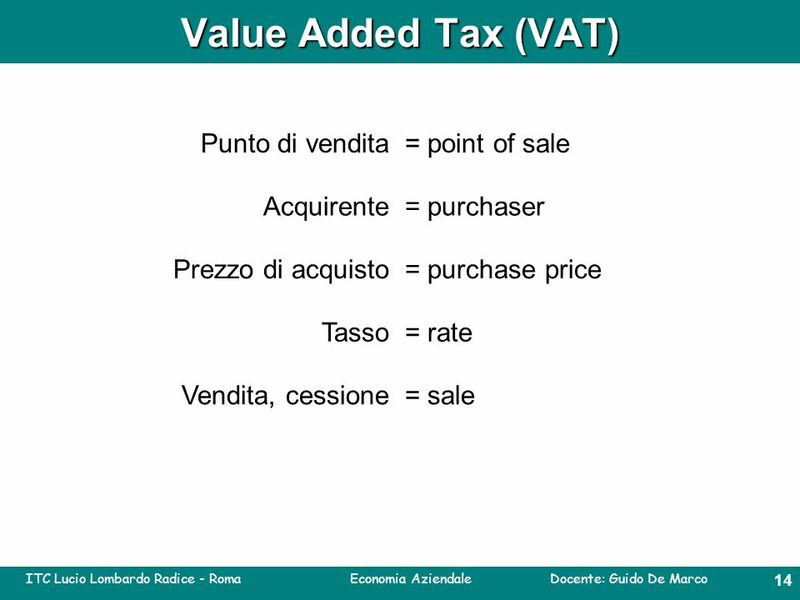 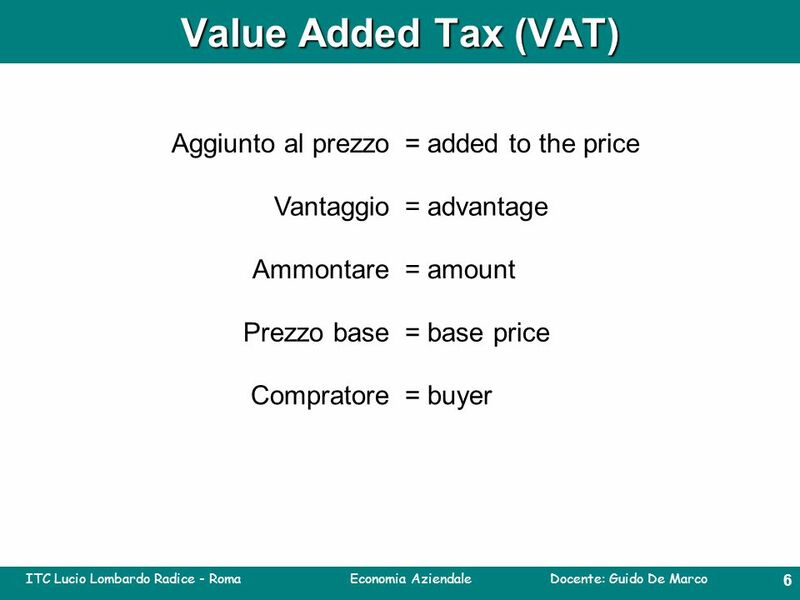 3 ITC Lucio Lombardo Radice - Roma Economia Aziendale Docente: Guido De Marco 2 Value Added Tax (VAT) Laws governing the tax may require it to be included in the price, tax-inclusive, or added to the price at the point of sale. 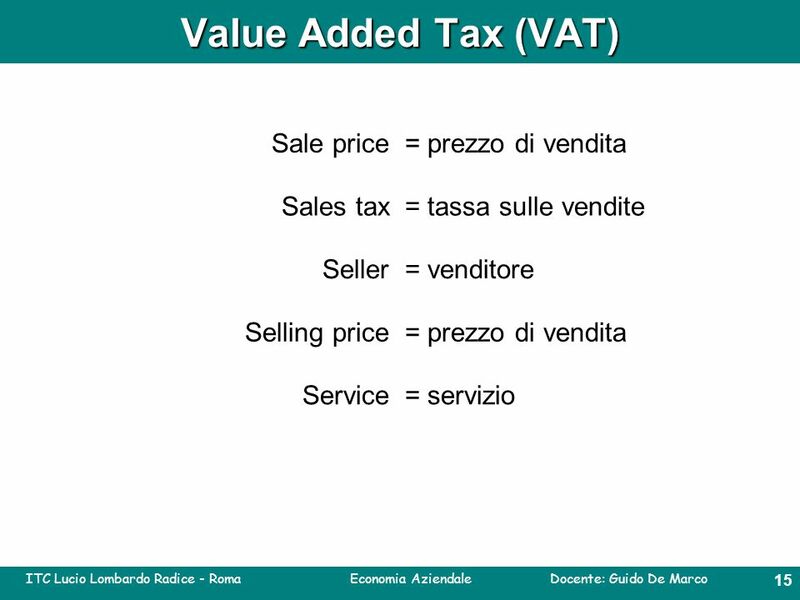 Most sales taxes are collected from the buyer by the seller, who remits the tax to a government agency. 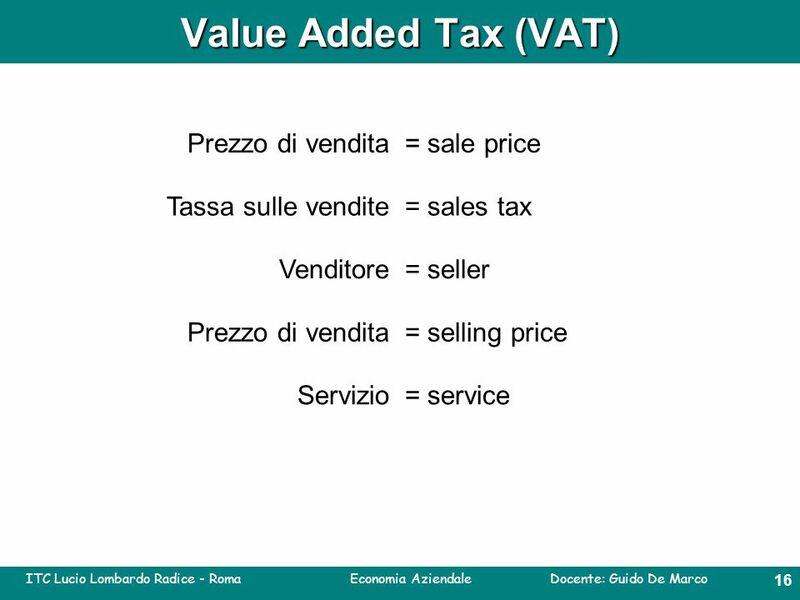 Sales taxes are commonly charged on sales of goods, but many sales taxes are also charged on sales of services. 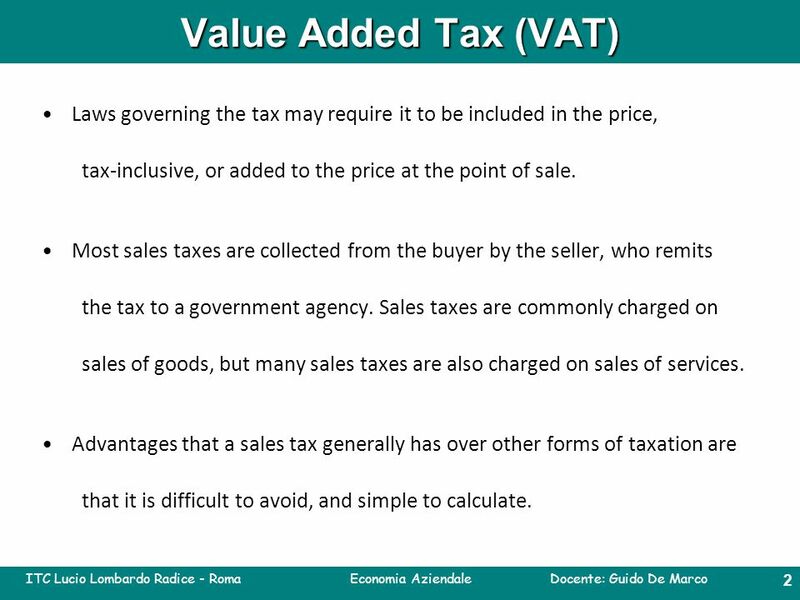 Advantages that a sales tax generally has over other forms of taxation are that it is difficult to avoid, and simple to calculate. 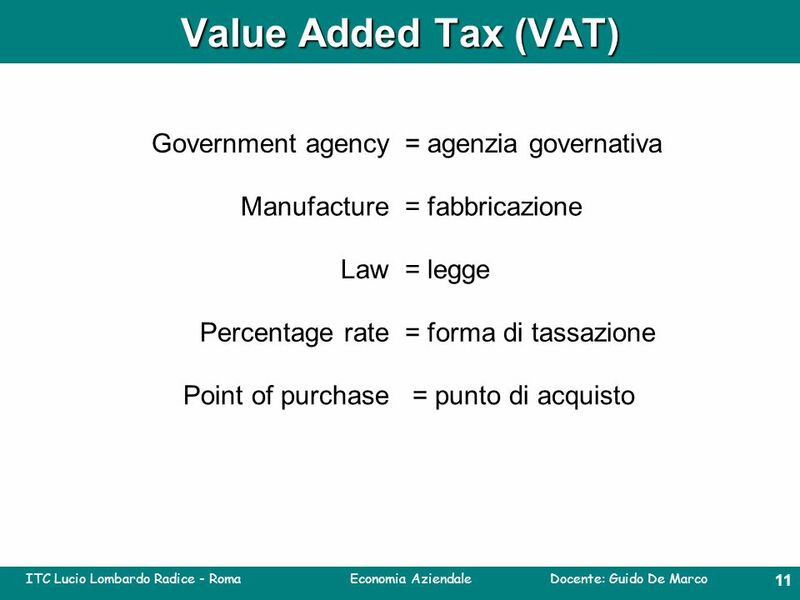 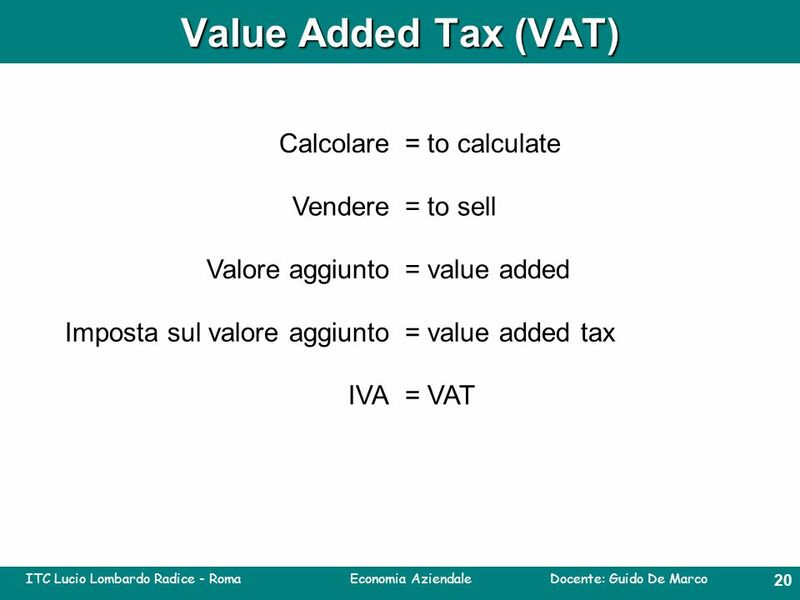 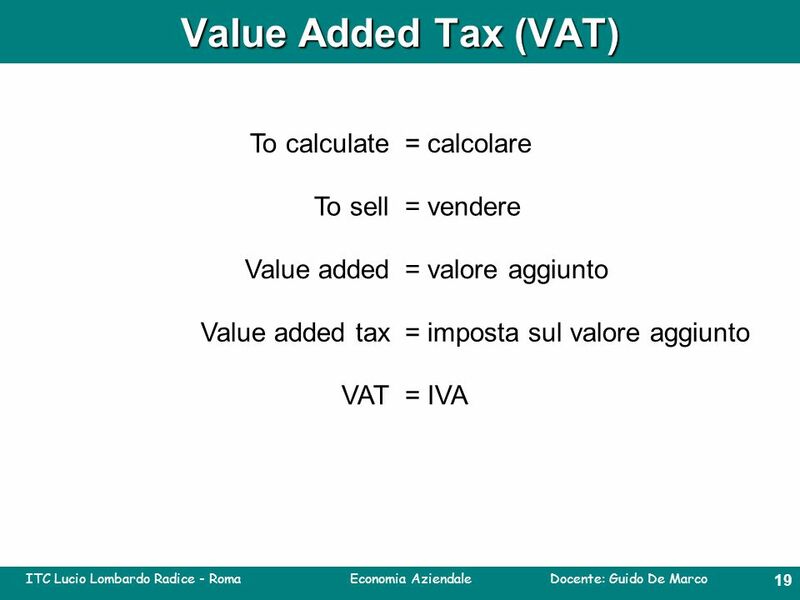 4 ITC Lucio Lombardo Radice - Roma Economia Aziendale Docente: Guido De Marco 3 Value Added Tax (VAT) A value added tax (VAT) is a form of consumption tax. 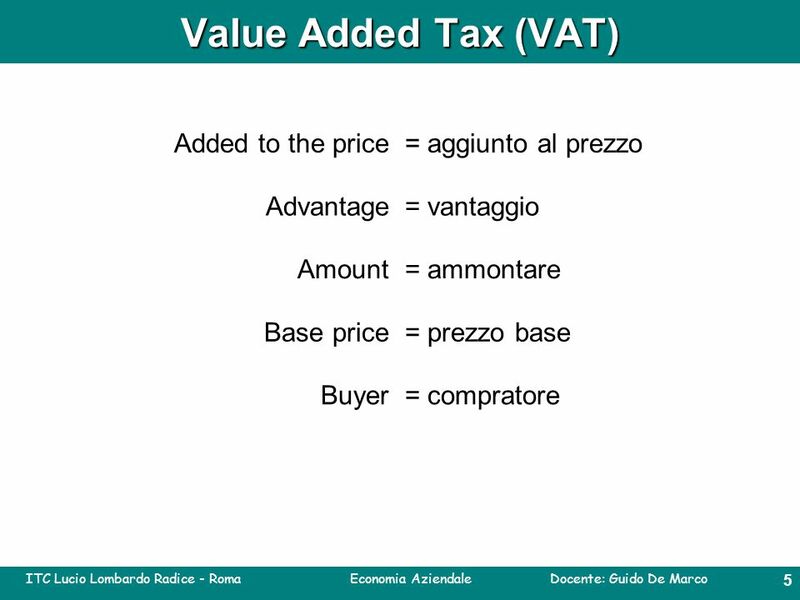 From the perspective of the buyer, it is a tax on the purchase price. 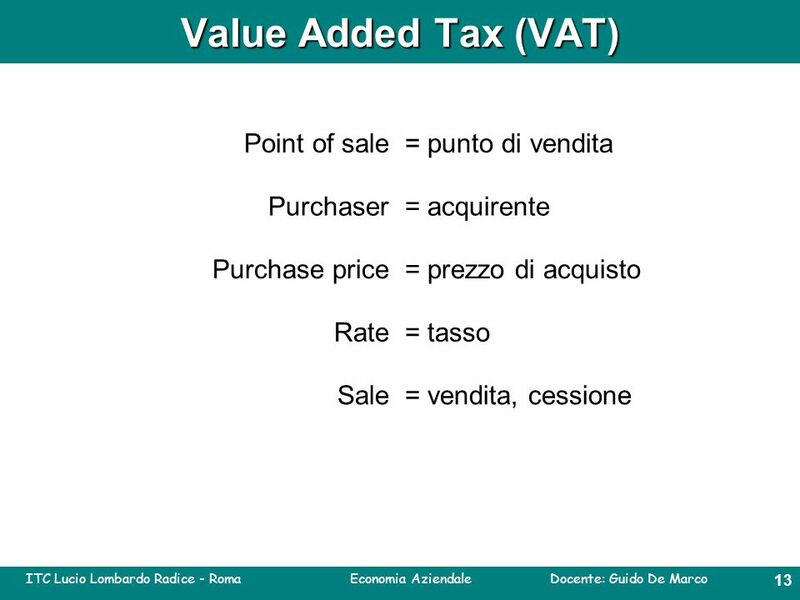 From the perspective of the seller, it is a tax only on the value added to a product, material or service. 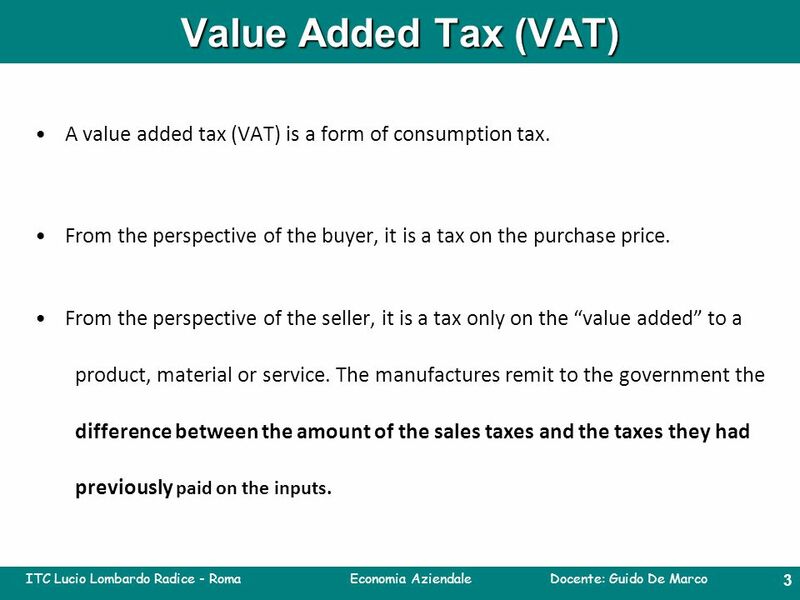 The manufactures remit to the government the difference between the amount of the sales taxes and the taxes they had previously paid on the inputs. 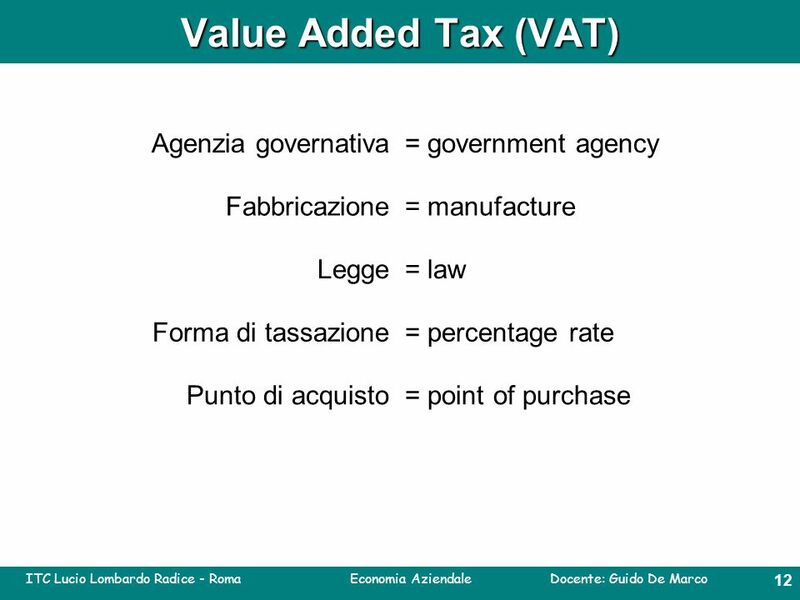 5 ITC Lucio Lombardo Radice - Roma Economia Aziendale Docente: Guido De Marco 4 Value Added Tax (VAT) The value added to a product by a company is the value of goods and services sold to its customer, minus the cost of materials and other taxable inputs. 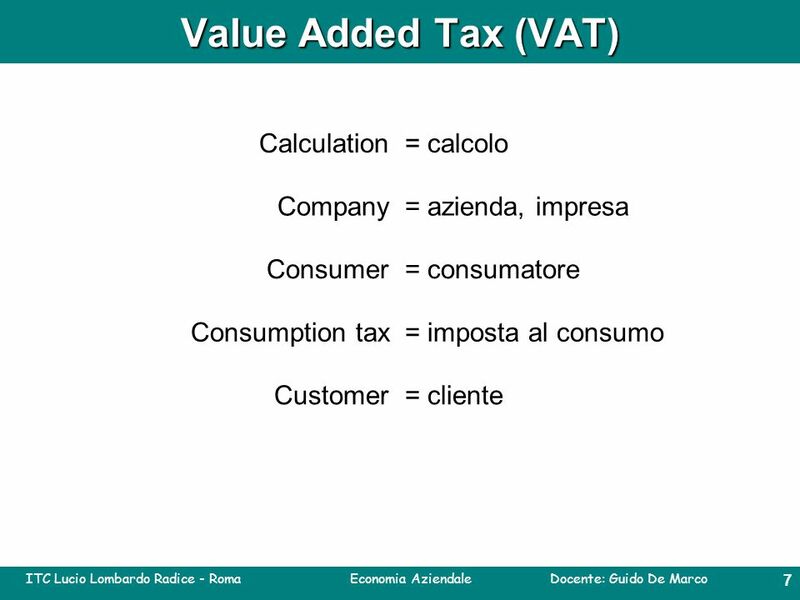 A VAT is like a consumption tax since ultimately only the end consumer is taxed. 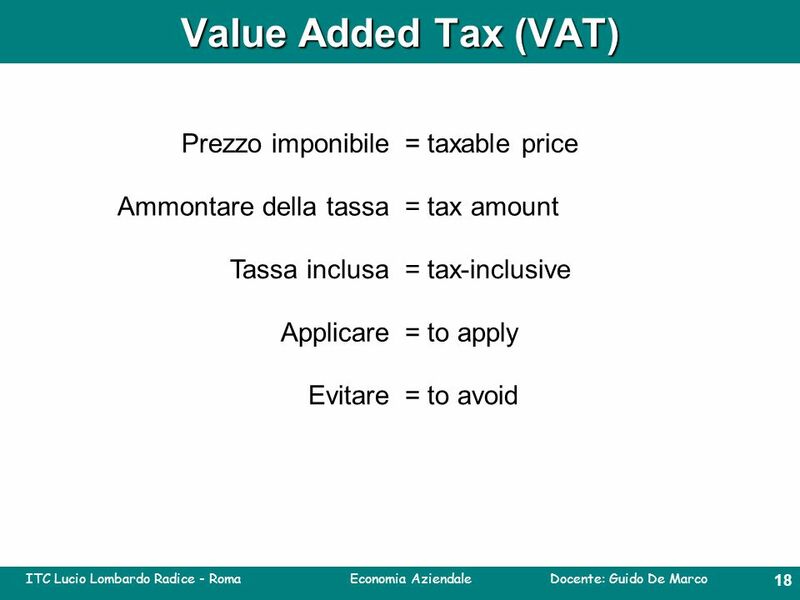 Download ppt "ITC Lucio Lombardo Radice - Roma Economia Aziendale Docente: Guido De Marco 0 Economia Aziendale ITC - Lucio Lombardo Radice Roma 3 F sistemi informativi." 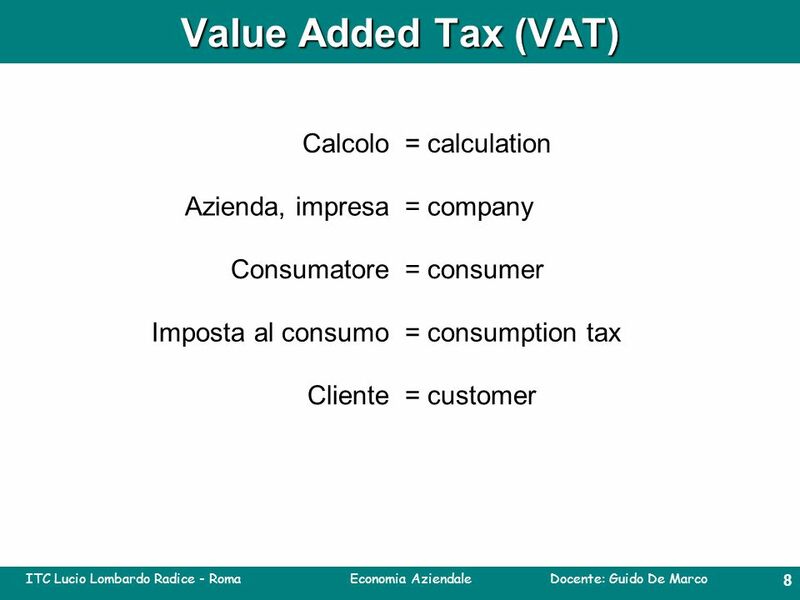 ITC Lucio Lombardo Radice - Roma Economia Aziendale Docente: Guido De Marco 0 ITC - Lucio Lombardo Radice Roma 3 D sistemi informativi Business. 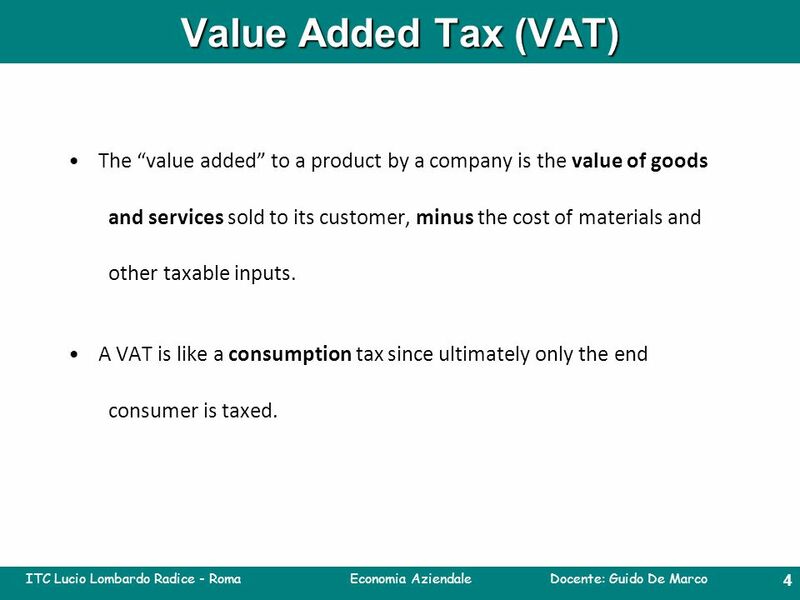 INTRODUCTION TO THE VALUE ADDED TAX (VAT) Copyright, Rita Marie Cain, 2001.